Measure internal peer review processes and implement proven solutions. Peer review continues to rate as a top challenge in healthcare organizations. Even if they are meeting regulatory standards, organizations struggle to develop a peer review program that is unbiased and meaningful, making it difficult to change physicians’ punitive view of the process. Get the tools you need to analyze and redesign your peer review processes. This product bundle combines two of our best-selling books, a webinar, and a direct one-on-one phone call with specialist Dr. Robert J Marder, to create an unrivalled package to help you evaluate and attack your biggest peer review challenges. Looking for metrics and real-world processes to assess your peer review program? 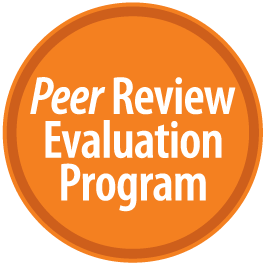 This resource offers the tools you need to analyze and redesign your peer review processes. Ten organizations of varying scope and size share their journey of revitalizing their disparate peer review programs into high-functioning and engaging physician performance assessment programs. Peer review continues to rate as a top challenge in healthcare organizations. Even if they are meeting regulatory standards, organizations struggle to develop a peer review program that is unbiased and meaningful, making it difficult to change physicians’ punitive view of the process. The book addresses ways to enhance all of the components of a successful competency assessment program, from case review to OPPE and FPPE, with entire chapters dedicated to medical staff culture, multispecialty peer review, and avoiding peer review pitfalls. Even while meeting regulatory standards, healthcare organizations still struggle to develop peer review programs that are unbiased and meaningful. Not addressing bias can lead down a path toward negligent credentialing or, in worst-case scenarios, a loss of accreditation.With so many variables involved, it can be hard for physician leaders) to determine what is the proper way to proceed. In a 60-minute phone call, Dr. Robert J. Marder will go over the current obstacles you are facing in your peer review program. 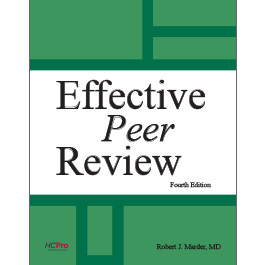 Revise your peer review processes with best-practice guidance from expert speaker Robert J. Marder, MD. Through case studies, Dr. Marder will provide examples and solutions from organizations around the nation who have successfully revised their peer review programs. This 90-minute webcast offers benchmarking guidance to measure internal peer review processes and implement proven solutions.